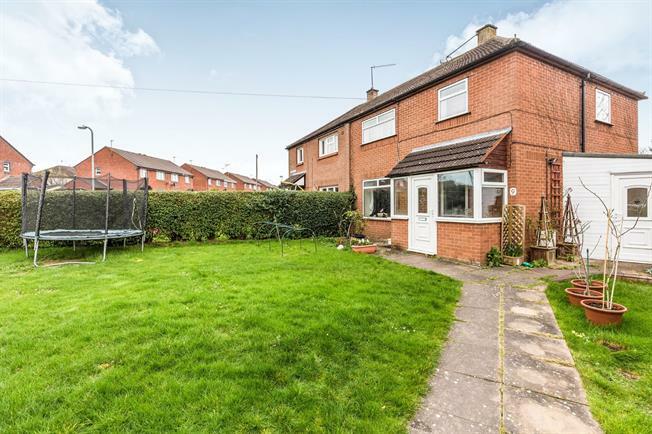 4 Bedroom Semi Detached House For Sale in Worcester for Offers Over £190,000. This extended four bedroom semi detached property is located on a corner plot and is offered with no onward chain. The property comprises of an entrance porch which leads through to the hall. The hall gives access through to the lounge/diner and kitchen. The lounge/diner then opens through to the conservatory. The kitchen has an integrated double oven and hob and washing machine and opens into the rear hall. The rear hall gives access to the fourth bedroom and en-suite. To the first floor there are three bedrooms and the bathroom. There is a garage and driveway providing parking for several vehicles. The property is accessed via a part glazed door which leads through to the porch. The porch then has a part glazed door leading through to the hall. The hall has a radiator, stairs leading to the first floor and doors leading through to the lounge/diner and kitchen. Double glazed window to the front aspect, radiator, patio door leading through to the conservatory and door leading through to the kitchen. Double glazed windows to the rear and side aspect, French doors leading onto the garden. Double glazed window to the rear aspect, a range of base and wall mounted units with work surface over, single sink unit with mixer tap and tiled splash backs behind, oven with hob and extractor hood over, integrated dishwasher, integrated washing machine and space for a fridge/freezer, two cupboards and doors leading through to the entrance hall and rear hallway. Doors leading through to the front and rear gardens, and door leading through to bedroom four. Double glazed window to the front aspect and door leading through to the en-suite. This room is an irregular shape. Double glazed window to the rear aspect, low level WC, wall mounted wash hand basin with tiled splash backs behind and walk in shower. Double glazed window to the side aspect and doors leading through to all the rooms. Double glazed window to the front aspect, radiator and wardrobes. Double glazed opaque window to the rear aspect, low level WC, wall mounted wash hand basin inset into vanity unit with tiled splash backs behind, panelled bath with shower over, heated towel rail and tiled flooring. The property is situated on a corner plot. The front garden is laid to lawn and has a central pathway which leads to the front door. The front garden is enclosed by hedging. To the side of the front garden is a driveway which provides parking for two vehicles. The driveway leads up to a detached garage with a side opening door. Detached garage with side opening doors. The rear garden is accessed from the rear hall and conservatory. The garden is low maintenance and laid to block paving. There are three shed and the garden is enclosed by panelled fencing.